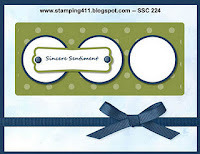 This weeks' Saturday Sketch Challenge over at Stamping 411 is a real winner! When I first looked at the sketch, I thought that it would be hard to come up with something, but this card just flowed out -- and created itself. I did adapt a couple of things -- I put the ribbon across the center of the card and moved the sentiment to inside. This is so cute!! Great take on the sketch! This is so adorable. I love it. It's got that old world charm to it. Fabulous! Don't you love it when a card just comes to you! Especially when they're as pretty as this! This is so perfect! Excellent card. Your card is absolutely gorgeous! I love it!!!! So pretty! What a wonderful take on this week's sketch. Thanks for playing at 411 this week. Super cute and blingy!! Thanks for playing along!! I just adore this creation. The sparkly Top Note as a background is stunning!!! Love it all!